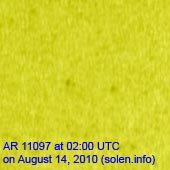 Last major update issued on August 14, 2010 at 04:30 UTC. Minor update posted at 11:50 UTC. 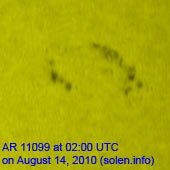 The geomagnetic field was quiet on August 13. 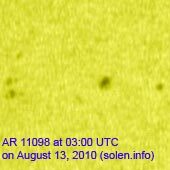 Solar wind speed ranged between 330 and 454 km/s. 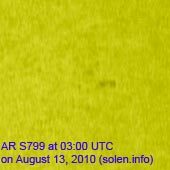 Solar flux measured at 20h UTC on 2.8 GHz was 83.7. 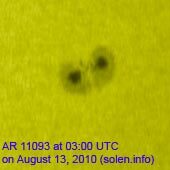 The planetary A index was 4 (STAR Ap - based on the mean of three hour interval ap indices: 3.5). Three hour interval K indices: 12011111 (planetary), 12011111 (Boulder). Region 11093 decayed slowly and quietly. Region 11097 reemerged with a couple of tiny spots. Region 11098 decayed slowly and was quiet. The region could soon become spotless. 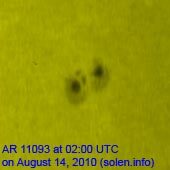 New region 11099 was observed with spots on August 12 and numbered by NOAA/SWPC the next day. This region is quite interesting as it is developing quickly. Positive magnetic flux emerged inside and in the eastern part of the negative leading polarity area. Further development will quickly increase the chance of C and even M class flares. 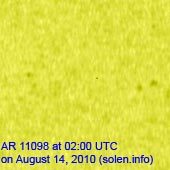 Update posted at 11:50 UTC on August 14: A C4.4 long duration event peaking at 10:05 UTC with an origin in region 11099 was a minor proton flare. Significant proton flares are possible if the region continues to grow. August 11-13: No obviously Earth directed CMEs were seen in LASCO or STEREO images. 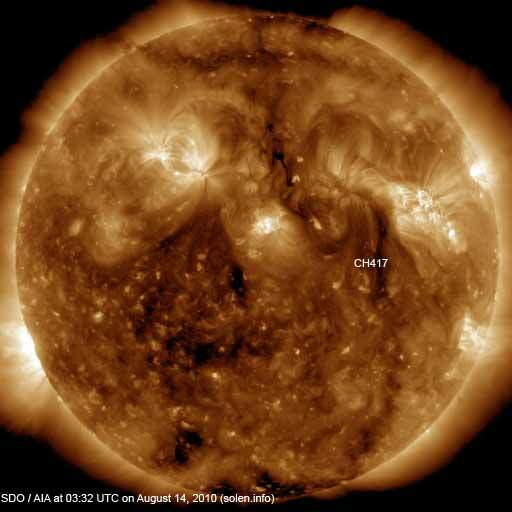 The geomagnetic field is expected to be quiet on August 14. Late on August 14 and on August 15 there's a chance of a few unsettled intervals due to effects from CH417. Quiet conditions are likely on August 16.